Another plane full of tourists comes in for a landing at the Nice Airport in France, Europe. 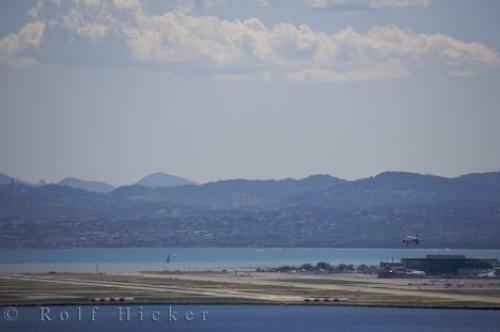 Photo of the airport in the city of Nice, France in Europe. ... The airport in Nice, France has been a stop for a few scheduled Concorde flights during the Monaco Grand Prix and the Cannes Film Festival. That in itself is a magnificent sight to see if you happen to be in Nice, France at the appropriate time to catch a glimpse of the Concorde.Nice Airport, Nice, Riviera, Provence, Cote d'Azur, France, Europe. I photographed this photo with the digital SLR camera model Canon EOS-1Ds Mark II, aperture of f/8.0, exposure time of 1/500 sec. on ISO 100, as always I used a original Canon Lens, the focus lenght for this picture was 400mm.